Version 3.0 of the PlayStation 3's firmware update will make its debut on September 1, and while it doesn't drastically change the way the system works, it brings a few new features to the table. Sony certainly isn't reinventing the wheel when it comes to the 3.0 firmware update for the PS3. This is far from a total rehaul for the system in the fashion of Microsoft's New Xbox Experience - it's just a few tweaks and additions that should hopefully make the experience more enjoyable and elegant. "First, you'll notice some cosmetic changes to the design of the XMB (Xross Media Bar)," Sony's Eric Lempel said. "We've enhanced the look and feel of the XMB so that it's easier and even more intuitive to use. We've also added network improvements and personalization options to help enhance your PS3 experience." 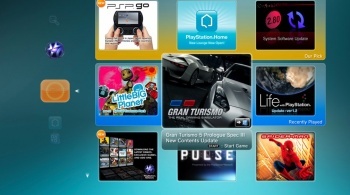 New features include a "What's New" section that replaces the Information Board with a stylish interactive display of PlayStation-related content, a Status Indicator that shows you basic info (friends online, messages, etc) on the top right of the screen, a redesigned Friends List, new ways to display Trophies and the arrival of "dynamic custom themes and avatars," which will come in normal and premium varieties. Premium, huh? That sounds expensive. In the demo Lempel gives over at the PlayStation blog, he shows off a neat LittleBigPlanet premium theme that replaces all the XMB icons with LBP-style ones and has a Sackboy running in the background. It looked nice, and it would be nice if this kind of thing was free, but it's probably not. "It's kind of another category within premium things, so it's another level," Lempel told G4TV. "We've got some themes today that can do some limited functionality, these gives the developer a great deal of tools to make them really exciting and do a lot with them." Same goes for premium avatars, though they probably won't have any real "premium" functionality. Instead, some avatars will cost money depending on whether or it's attached to an IP or it cost money to make, so, like, a Nathan Drake avatar might be a premium and require you to pay. It doesn't seem like it's totally set in stone yet, but paying for a Nathan Drake user icon? I think I'll pass. 3.0 will hit on September 1, the same date as the PS3 Slim.